I've spent months complaining about the heat and the humidity and the fires. As we crawled through the beginning of Autumn, the weather remained unrelentingly and record-breakingly hot. Then, suddenly, Melbourne appeared to become sick of at all as well. In the last week the weather plummeted below 30°C and even granted us a whole bunch of rain and storms to go with it. I had lots of fun dancing around in summer dresses remembering what it felt like to be cold once more. It was a welcome feeling, indeed. Something else we collectively rejoiced was the return of warm, hearty meals. Dinners have been focussed around finding refreshing-feeling meals to help us get through the heat. Now, touch wood, we can return to just eating whatever we enjoy. 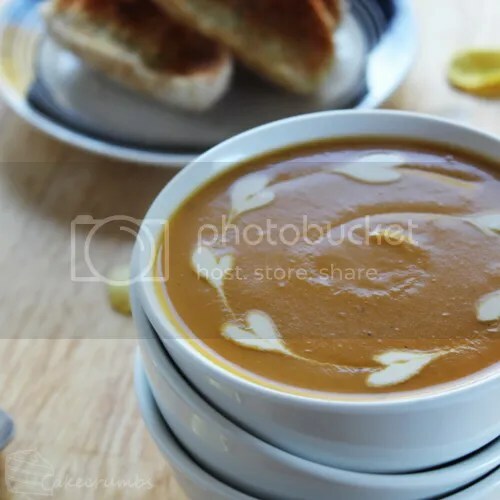 This pumpkin soup is a staple in my household. Which says a lot, considering most of us dislike pumpkin. Through it, I have to admit, I'm slowly acquiring a taste for the vegetable in it's pure form. I'm often asked to make this soup. It's probably my most requested meal. Its recipients will often tell me how not only is it their favourite soup, but how they can hardly stand to eat another version. The very sight of pumpkin in our fridge is always followed by, "Pumpkin! Does that mean you're making soup?" If I so much as hint at the idea of making a soup, I'm requested to make this one. Despite my protests, despite suggesting I broaden my horizons and try something new, it would seem my family could care less if I never made another soup again. As long as they get to eat this one. I may not understand their love affair with it, but if it is so wanted then I can only oblige. But the best part is how flexible this recipe is. I can make it with pantry ingredients and any vegetables asking to be used. I've swapped and subbed, based on what was available at the time, and no one has been able to discern a difference in the flavour. There's no secret. It's just the pleasant result of fresh, delicious produce. When I make it, I use a large stock pot and make an enormous batch. I always intend to have some leftovers and to freeze some for a lazy day – though sometimes after everyone has has a second, or a third helping, it doesn't make it that far. I tend not to measure any quantities, instead grabbing a huge pile of pumpkin, flavouring vegetables and adding just enough stock to touch all the vegetables. You need not fret about accuracy nor worry about small changes to the recipe (I'm sure I season it differently every single time). The recipe below is a rough approximation of a medium batch of soup, perhaps half of what I usually make. If you don't want leftovers, feel free to halve it again. I use butternut pumpkin as I find the flavour is just superior, but feel free to use whatever pumpkin you like or can afford. Don't bother peeling any vegetable with a thin skin, such as carrots. The skin holds all the nutrients and will be unnoticeable in the final product. 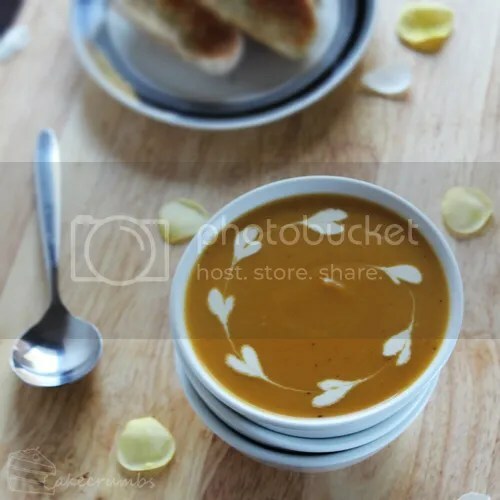 *typical flavouring vegetables for this soup are onion, celery, carrot and turnip. Sometimes I'll use potato as well to make it a little extra creamy. Melt butter in a large pot over medium heat; sauté vegetables for 5 minutes, stirring occasionally (keep lid on between stirring to 'sweat' vegetables). Add flavourings, seasoning and enough stock to just reach the top of the vegetables. Return to high heat and bring to the boil. Reduce heat to low and simmer for 30 minutes, or until vegetables are tender. Remove from heat. Using an electric blender or stick blender, puree the soup (if using an electric blender, you'll probably have to do this in batches). Return soup to the pot and reheat over medium heat without boiling. Add enough cream to give the soup the colour and taste of your preference (you may prefer the soup without the cream — taste as you go). Serve with bread or croutons, and garnish as desired. I have heard that term before. We don’t call any of them squash in Australia, it’s aaall pumpkin. So any pumpkin is fine to substitute, really. Most people would use a larger variety of pumpkin for this (they tend to use the cheapest pumpkin for soup and save butternut for roasting or general nomming). I saw the name “Pumpkin Soup” and thought this was going to be a Zelda recipe. I’m still not disappointed in the slightest. 😀 Coincidentally, I tried butternut squash soup for the first time this past weekend, loved it, and was wanting a recipe for a good homemade version! I think the universe is trying to tell me something, haha. I always enjoy consuming your pumpkin soup. It’s definitely very addictive and leaves you with a nice comforting feeling.